Parrots are a family of raucous birds within the order Psittaciformes, consisting of about 372 species found on all continents except Antarctica, and characterized by a deeply-hooked bill, often gaudy plumage, and a high intelligence. Kept as cage birds for millennia, parrots retain a popularity due to intelligence, playfulness, and an astonishing ability to imitate human speech and many other sounds. It is primarily due to the pet trade that some 90 species are threatened with extinction. 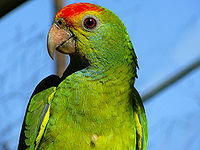 Parrots range in size from the small lovebirds at 6 inches to some 36-40 inches for the larger macaw species. The heaviest species, the New Zealand kakapo, weighs in at 9 pounds, nearly three times the weight of the largest macaw. Parrots have an upright stance when perched; when not flying they move about in the trees using their hooked beak as a climbing aid. On the ground they walk with a rolling gait. Both feet are zygodactyl, i.e. two toes in front, two toes behind, a trait shared with owls and woodpeckers. Parrots further use one foot as a "hand" to hold and bring food to its mouth. Parrot plumage is also unique in that the brilliant colors are not the result of diet; they are made directly within the feathers by a set of five pigments, or psittacofulvins, a trait found in no other bird species. Family Strigopidae (New Zealand parrots). Fruits, seeds, and nuts make up the diet of most parrots. Macaws have bills strong enough to crack the Brazil nut, while lorikeets subsist on nectar from flowers. The kea (Nestor notabilis) has been seen to eat carrion, and is suspected of attacks on sheep. Flocks of parrots in large numbers often take advantage of human crops. In India, Sri Lanka, and Burma, farmers have to contend with large flocks of rose-ringed parakeets (Psittacula krameri), which inflict heavy losses on orchards, wheat fields, and rice paddies, while in Malaysia the long-tailed parakeet (Psittacula longicauda) strips the pulp from oil palms; in both cases farmers have to kill a large number of birds to maintain control and reduce their losses, a tactic which resulted, in part, in the extinction of the Carolina parakeet (Conuropsis carolinensis) in the United States.